Emy Tseng sings at SOVA Wine Bar on H Street, NE, Washington, DC. 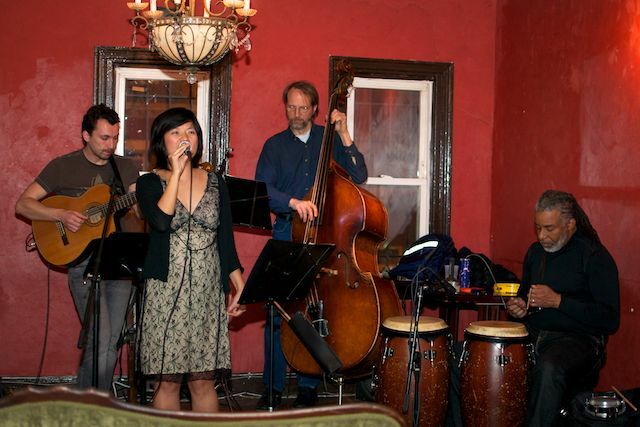 A jazz singer and wine bar are a great combination for evening entertainment -- unless you plan to take pictures. Once you introduce a camera, what was once charming becomes challenging. I wanted to illustrate low light photography by shooting a live music performance and got my wish in an invitation to see Emy Tseng perform at SOVA Expresso & Wine on H Street, N.E. SOVA has a cozy upstairs venue -- deep red walls, comfy couches, and best of all, low light to create the atmosphere. If you were on a date, you’d relish the ambiance. If you were toting a camera, you’d be a bit more antsy. Emy was right at home. She is a bubbly and talented singer who found her niche in Brazilian jazz. Now she sings monthly at SOVA and performs Thursdays at the Utopia Bar and Grill on U Street, N.W. I’m digging the vibe and atmosphere at SOVA, but to shoot this performance, I have two options: let in a lot of natural light or use a flash. I ruled out the flash option because, after all, this is a low light shoot. You basically manipulate three levers to get more light into your camera -- how wide your shutter opens, how long your shutter opens, and your ISO setting. At SOVA, I maxed out all three. You measure how wide your shutter opens with your aperture, or F-Stop. A lower F-stop number means a wider aperture opening. I used a lens that would allow me to open to F 1.8. The lens was a fixed 35mm, meaning it was a wide angle setting that didn’t zoom. The second lever that controls the amount of light coming into your camera is the shutter speed -- how long the shutter stays open. You measure that in fractions of a second. You want to choose a shutter speed that is slow enough to let in lots of light but not so slow that you can accidently shake the camera and blur your image. Your third lever is the ISO setting. This tells you how much light your film or digital sensor needs for a good exposure. The higher the number, the less light you need to expose your photo. Your average consumer camera these days maxes out between ISO 1600 to ISO 3200. Shooting at those high settings will allow you to take pictures in very low light, but you have a trade off -- digital noise. As the ISO numbers increase, the image pixels get bigger and your color desaturates. I had to shoot Emy at ISO 3200. On my Nikon D300s, the pixels were clearly going to show up. A slow shutter speed makes the drummer's hands blur.If you know what that means, I pushed every boundary to get a good exposure using existing light and no tripod. You’ll see that I got a decently exposed image. You can also see how ISO 3200 leaves noticeable image noise. With the picture of the drummer on the right, you can see how the slow shutter speed shows up as motion blur. Here’s how you fix a photo like Emy's. Make it black and white and add some vignettes around the edges. Voila! You have art. Shhh. Don’t tell anyone. Focal Point: SOVA Expresso & Wine, 1359 H Street, NE, Washington, DC. This is what the full band looked like. I shot this with a flash from the back of the room.